I posted on my instastories recently that I made a quick batch up granola bars and I received a handful of inquiries about the recipe. I also received a few more requests to post about it on my blog so here I am! I have to confess that I don't use a formal recipe at this point. 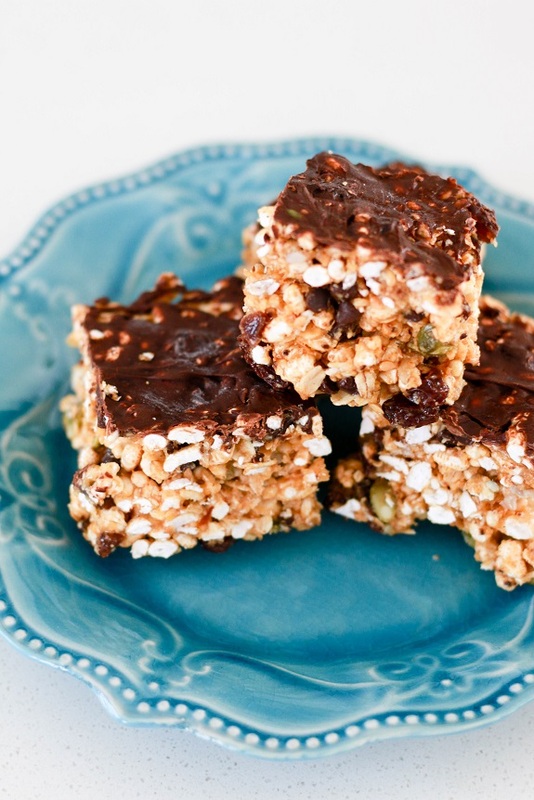 I've made a few different bar recipes over the year that I've loved and once I got familiar with the ingredients it became pretty easy to just throw granola bars together with what I have on hand. I love the Oh She Glows Glo Bars (you can find the mama version on her blog here) and back in 2011 I posted a recipe for some clean eating protein bars I loved. They aren't as simple to make but were really delicious so go take a look at that recipe here! I should probably give them a whirl again soon. I have made this recipe a number of ways and they are all delicious. The granola bars shown here have a thin layer of chocolate on top and some chocolate chips inside because... sugar. I cut them into squares to give them more of a dessert feel and they were delicious in the afternoon as a little pick me up. 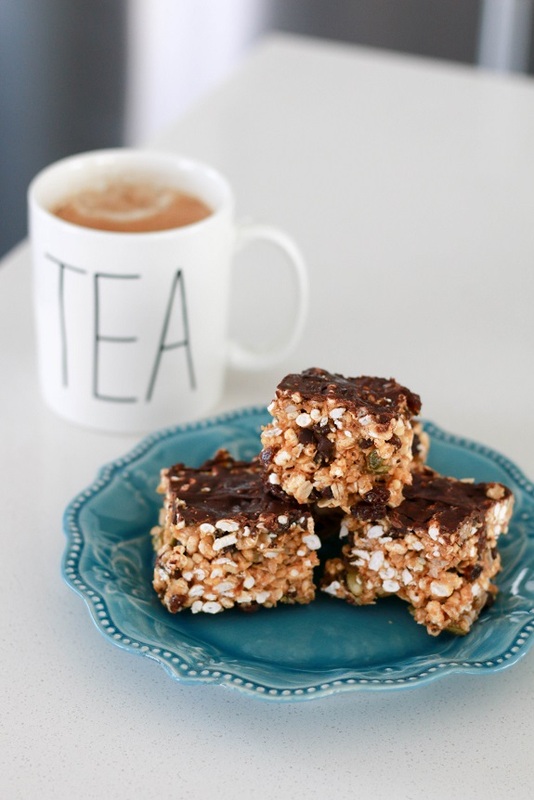 I've also made this recipe with no chocolate (so no added sugar) and they are just as delicious! I like to cut them up into more of a bar shape to give me that store bought granola bar feel. 1 Cup of an Oat, Seed and Nut mix. In other words, combine some quick cook oats with your favourite seeds and nuts and then put 1 cup of it in your recipe. I don't use nuts because I'm allergic. Optional: Raisins and Chocolate Chips. Mix the runny peanut butter, brown rice syrup and vanilla together in a large bowl. Once it's mixed, add the rice cereal and oat mix into the wet ingredients one cup at a time and mix it all together. You're looking for your dry ingredients to be fully covered in the wet ingredients. If you're worried about if you have the right consistency, add a little bit more peanut butter and/or brown rice syrup. It's safer to aim on the side of too much wet ingredients versus not enough. Add your raisins and or chocolate chips if you feel so inclined. I have no measurements for those, it's up to you! Line a 9x9 baking dish with parchment paper. I like to make sure there is some over hang so it's easier to get your bars out. Pour your mixture in and spread out evenly. Press your mixture down and try to really pack it down so your bars hold together really well. Once your bar mixture is nice and flat on top put it in the freezer for at least 20 minutes. When your bars are nice and firm you can remove them from the pan and cut into 12 bars. I like to keep them cut up and in the freezer so they are easy to grab when I feel snacky... which is often. If you'd like your bars to be more decadent you can add a thin layer of chocolate on top before putting them into the freezer. Let me warn you though, as a gal with a sweet tooth, the chocolate on top made these very sweet. Let me know if you give these a try! They are honestly so easy and after making them a few times they are very quick. I also love that they just use one bowl because who likes to clean up?